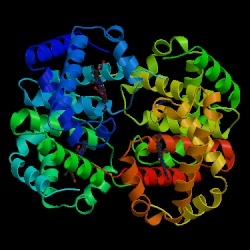 Picture of hemoglobin protein. Taken from the PDB database. Click here to perform a Kyte-Doolittle hydropathy plot on your sequence. Find the sequence of your favorite gene or protein or learn more about your protein or gene using our cool links. A portion of the hydropathy plot for the hemoglobin protein shown above. Created by the program on this web site. This web page was created by Soren Jonhson, Rachel McCord, and Lisa Robinson.